Businesses who need disaster recovery replication of their data but do not want to make the large investment of a second datacenter and NetApp Storage Cluster can instead choose to have the remote site located at HPC Host. We provide the NetApp hardware and technical expertise to implement and manitain a complete replication environment. Should the need arise you can be safely assured your data will be available at one of our datacenters to restore from at any time. You can focus on your business and rest assured that the replication is handled by HPC Host certified engineers. HPC Host configures and maintains its replication environment leaving no additional work for the customer to implement. Adding cloud-based Replication requires a much smaller investment than that required for a dedicated off site solution.And it makes your IT budget go further by eliminating large capital expenditures (CapEx) for securing data and replacing it with predictable, monthly operational expenditures (OpEx). 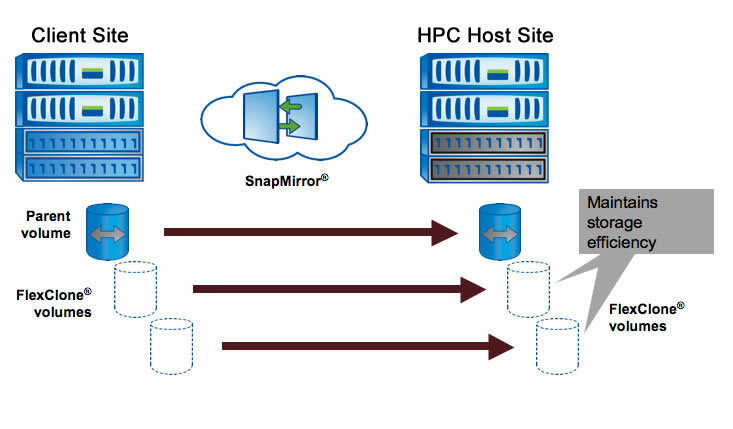 HPC Host Netapp Replication is delivered from highly secure SSAE 16 certified datacenters. Your backup data is replicated across a secure connection onto dedicated NetApp hardware specific to your company and completely isolated from other customer organizations. Complete this form to speak with a Netapp Certified Engineer!